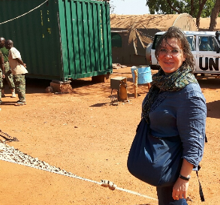 Zenaide Gatelli currently serves in the United Nations Assistance Mission in Somalia (UNSOM) as Head of DDR Section (Disarmament, Demobilization and Reintegration) since April 2017. She has served in the United Nations system since 2004, in United Nations Peacekeeping missions, UN Special Political Missions and in the United Nations Development Programme. She served as DDR Officer, Head of the “Operations & Projects Cell, in MINUSCA (United Nations Mission in Central African Republic), from March 2015 to March 2017. She worked in MONUSCO (UN Mission in D.R. Congo) as DDR/RR Team Leader/North Kivu in the period March 2013-March 2015; in Sudan (UNMIS) and in South Sudan (UNMISS) as Civil Affairs Officer in the period end 2010-March 2013; in the United Nations Assistance Mission in Iraq as Humanitarian Affairs Officer, in Baghdad from July 2009 to December 2010; in the United Nations Operation in Ivory Coast (UNOCI) as DDR Officer between 2007 and 2009. She served as Reintegration Expert for the United Nations Development Programme (UNDP) in the period 2004-2006, in a programme for reintegration of ex-combatants and community recovery in the eastern D.R. Congo. She worked in Kosovo in the period October 2001-March 2004 for an International NGO, implementing projects for the socio-economic reintegration of people with disabilities. Prior to these work experiences in post-conflict contexts, she worked in Italy, her home country, in various programmes for socio-economic reintegration of vulnerable groups (people with disabilities, ex-detainees, ex-drug addicts, immigrant women victims of trafficking). Ms Zenaide Gatelli holds a University Degree in Sociology and a Masters Degree in Peacebuilding and Conflict Management from the University of Trento (Italy).